Catherine is a 14-year-old elder sister to 2 siblings. A meeting with her primary school’s head teacher proved to us that she is not only a bright girl, but also disciplined and devoted to her schooling. Her teacher mentioned to us that, over the last 3 terms, she was among those who earned the best girls award, based on her attitude, academic performance, and engagement in extracurricular activities. A look at her academic performance revealed a strong student, scoring an average of 350 marks. Our interview with Catherine proved that she is indeed a deserving student. First, she mentioned to us that she loves mathematics and science. She told us these subjects will help her in achieving her career goal of a civil engineer. This is a unique career goal for a girl from Laikipia to mention, especially since she will be the first civil engineer from her village. Catherine also mentioned that she loves athletics and participates in races hosted by her school from time to time. Catherine’s mother and father are both day laborers who rely on seasonal farming jobs to feed their family. With this year’s extended dry season, Catherine’s parents have not been able to find jobs and can barely provide their children’s basic needs, such as food and clothing. 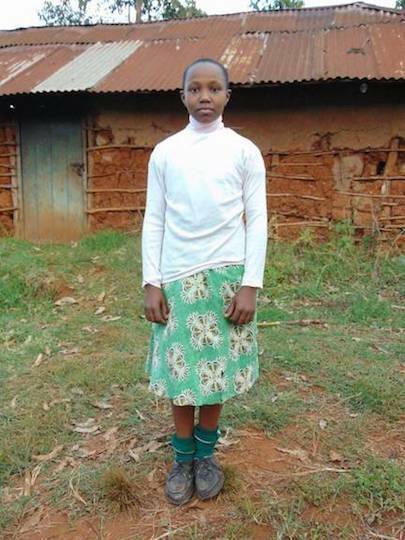 Catherine sincerely hopes that she will find someone to support her education and enable her achieve her dreams.